New York Times story on the acquisition of Newsweek by the Washington Post, March 10, 1961. It was early March 1961. A young John F. Kennedy was just months into his new presidency, “Blue Moon” by The Marcels was the No. 1 hit on the radio, and The Great Impostor with Tony Curtis had just opened in movie houses. In New York, Phil Graham, the 45 year-old publisher of the Washington Post, was in Manhattan on business. He had just written a personal check for $2 million to the Astor Foundation. The check was earnest money for an $8.9 million block of stock The Post would buy as part of its $15 million deal to acquire Newsweek, then the nation’s second largest weekly news magazine behind Time. The transaction marked one of those mid-20th century business deals that was changing the newspaper industry and signaling, in part, how big media would take form through the remainder of the century. For the Washington Post, the acquisition of Newsweek would become a major asset and would help make it become a much bigger and more influential player in news, information, and politics. 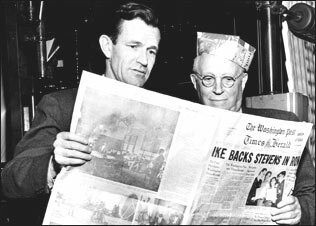 Phil Graham & Eugene Meyer holding 1st copy of the newly merged Washington Post-Times Herald, amid St. Pat’s celebration, 17 March 1954. Founded in 1877, the Washington Post had grown from something of second-tier newspaper in a town that once had several. Over the years, the Post had been sold to a succession of new owners, not all of whom were focused on making it a good business or a good newspaper. In 1933, Eugene Meyer, a financier, bought the paper at public auction for $825,000. Meyer set about to turn around the failing enterprise and to run a respected paper. In March 1935, he published — on the front page — his paper’s principles and standards for truthfulness and decency. By 1943, The Washington Post circulation was 165,000 — more than triple its 1933 figure. Advertising also tripled. Then, in 1940, a young lawyer named Phil Graham, married Meyer’s daughter Katharine. A few years later, in 1946, at the age of 31, Graham dropped his law career and became associate publisher of his father-in-law’s newspaper. Within six months he was publisher and by 1948, after a gift from his father-in-law, he and his wife Katharine held all of the Post’s voting stock. 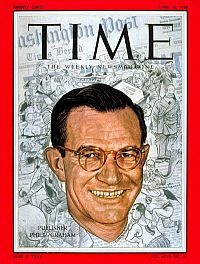 Phil Graham, rising newspaper man, on Time cover, 1956. Graham then bought out one of his competitors, the Washington Times-Herald in 1954, becoming the city’s only morning paper. Within two years of that deal, Graham had doubled the Post’s circulation and he was featured on the cover of Time magazine. He had also acquired two television stations. In 1959, after Eugene Meyer died, Graham became president of the Washington Post Company. 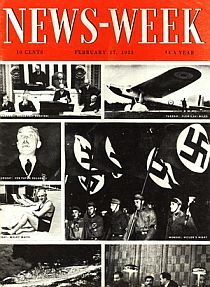 Newsweek, originally launched under the name News-Week in February 1933, was founded with the help of a group of wealthy stockholders that included Ward Cheney, of the Cheney silk family; John Hay Whitney, owner of the New York Herald Tribune; and Paul Mellon, of the industrial and banking Mellons. Other industrialists, investment bankers, and corporate lawyers were also added to the magazine’s stockholders in later years. News-Week’s first issue in 1933 featured seven photographs from the week’s news on its cover. By 1937, it merged with another weekly journal named Today, founded several years earlier by former New York Governor and diplomat Averell Harriman and Vincent Astor of the prominent Astor family. Vincent Astor became News-Week’s chairman and its principal stockholder. Malcolm Muir took charge as editor-in-chief and President, changing the news magazine’s name to Newsweek, abolishing the hyphen. 1st edition of News-Week, 17 Feb 1933, featuring its '7-photos-of-the-week' format, later abandoned as confusing to readers. Newsweek was profitable from the early 1940s. During World War II, it put out a pocket-size special edition for the troops in Europe, and at war’s end in 1945, published its first international editions in Tokyo and Paris. Through the 1950s, Newsweek enjoyed increasing circulation. Vincent Astor, with a stake of 59 percent, died in 1959. With Astor’s death, rumors began to circulate about the family’s interest in selling the magazine. Malcolm Muir, Newsweek’s president and editor following Astors’ death, was among those inter- ested in acquiring the magazine. I was sitting in his living room ten minutes later. I stayed there talking, and trying to answer his questions — mostly about people, who was good and who was bad and why — until just before 5:00 a.m. I was back at 9:00 a.m., as ordered, with fifty pages of thoughts, “just stream-of-consciousness stuff. . . No one’s going to read it but me,” Graham told me. I scarcely knew Phil Graham. . . .
Ben Bradlee writes about the Newsweek deal, among other things, in his 1995 memoir. Bradlee thereafter became part of Graham’s inner group of advisers on the deal, and traveled to New York with Graham as the deal unfolded. Among others bidders for Newsweek was the magazine’s then Chairman Malcolm Muir, 75, who hoped to enlarge his family’s 13 percent holding in the magazine with the Astor shares. But after Phil Graham heard that bidding for the foundation stock had held around $45 a share, he raised his bid to $50, which was then about 24 times the magazine’s earnings per share. Some back home at the Post worried about the amount of money involved, and thought it could better spent to improve the Post’s operations and quality. “Though the official selling price for Newsweek was $15 million, in the end no more than $75,000 really changed hands. It was one of the great steals of contemporary journal- ism.” –David Halberstam And in addition to the bidding for Newsweek by Muir, others with considerable resources were also involved, including Doubleday, the book publisher, and Sam Newhouse, the newspaper mogul. But in the end, Graham’s offer of $50 a share proved the winning bid as the Post took the prize. 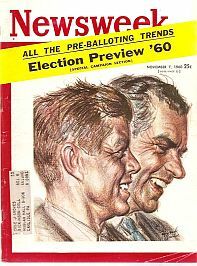 Newsweek in Nov 1960, prior to the Washington Post acquisition. Phil Graham, meanwhile, went on to expand the reach and influence of the Washington Post Co. and its assorted enterprises. In 1962, Graham helped establish a 50/50 Washington Post-Los Angeles Times news service formed to broaden and syndicate the reach of both papers. The service soon boasted a strong Washington bureau as well as global coverage with a range of notable writers. Graham also went looking for additional writing talent, and in October 1962 he signed up New York Herald Tribune columnist Walter Lippmann, who would also write columns for Newsweek and the new wire service. A month later, he added another well-known writer, Joe Alsop. The news service by then had signed up 33 U.S. dailies with the British papers, the London Sunday Times, Manchester Guardian, and London Observer coming on later. Back at the Washington Post, Graham had raised salaries, increased circulation, and beat rival Washington Star in advertising. But Phil Graham was in trouble. Graham, for some years, had been an undiagnosed and untreated manic-depressive, and in the early 1960s, his condition worsened. In August 1963, he took his own life. The event devastated the Post and was seen as a major loss. Sam Newhouse offered Katharine Graham $100 million for Newsweek, but she wasn’t selling. Gradually, following Phil Graham’s passing, his wife and Eugene Meyer’s daughter, Katharine, also known as Kay by colleagues, assumed the mantle at The Washington Post, including Newsweek. Two years after her husband’s death, in 1965, Sam Newhouse offered Katharine Graham $100 million for Newsweek, a substantial premium over what Phil Graham had paid of it. But Katharine Graham wasn’t interested in selling. She was interested in growing her company. Along the way, she pumped more money into Newsweek, eventually making it a more robust player in the weekly competition with Time and U.S. News & World Report. Vietnam War story, 13 Feb 1969. 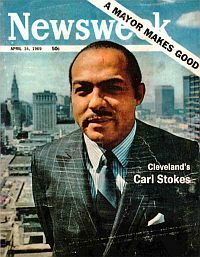 Cleveland's first black mayor featured, April 14, 1969. 30 July 1973 edition, after the Post had broken Watergate story. During the 1960s, Newsweek distinguished itself from Time by appealing to younger readers and focusing on two big stories of the era: race relations and the Vietnam War. In July of 1963, Newsweek had already been the first major news magazine to put the face of an unknown black American on its cover. But in November of 1967, the magazine ran a civil rights cover story and editorial. Newsweek‘s then-editor Osborn Elliott, would later say the cover story questioned traditional notions of journalistic “objectivity,” calling it the first example advocacy journalism by any major magazine.” In 1968, following the Tet Offensive in Vietnam, Newsweek again offered its views, this time calling for de-escalation of the war and eventual U.S. withdrawal. Back at the Washington Post, Kay Graham was also focusing on her newspaper. In August 1965, she lured Ben Bradlee away from his Newsweek bureau chief post to become a deputy managing editor at the Post, with promises of bigger things to come. By 1968, Bradlee became executive editor with Kay Graham’s backingNewsweek became a leader in advocacy journalism.. He initiated change at the paper early on, including the January 1969 creation of a culturally and politically attuned “Style” section, replacing a dated “For and About Women” section. Bradlee and Graham would proceed to lead the paper into the thicket of some of the next decade’s most important issues, publishing the Pentagon Papers in 1971 — a secret history of the Vietnam War — and winning a Pulitzer prize for the paper with its 1972-73 coverage of the Watergate scandal that led to the resignation of President Richard Nixon. The Post’s coverage of these and other issues would also show through to some extent in Newsweek’s coverage. Today, the Washington Post Co. is a major media concern with wide ranging newspaper, radio, television, magazine, educational services, and internet holdings. Newsweek now offers 12 editions, appearing in more than 190 countries, with an audience of some 21 million readers. According to Washington Post Co., Newsweek has won more National Magazine Awards and more Loeb Awards than any other newsweekly. (Note: the above graph was written in 2008). The Washington Post continued to publish Newsweek through the 2000s. However, by 2008 Newsweek was losing money – $16 million that year, followed by $29 million loss in 2009, and heading for another $20 million-plus loss in 2010. Advertising had been down 30 percent in 2009 and 40 percent in the first three months of 2010. Then there was the euphemistically described “generational change in reading patterns,” meaning the digital tsunami that was ravaging traditional print newspapers and magazines. In May 2010, after 49 years of Newsweek ownership, the Washington Post put the magazine up for sale. December 2012: Last print issue of Newsweek. By August 2010, Newsweek was sold to Sidney Harman – of Harman-Karman music systems fame and more. Harman, then 92, entered a partnership with Washington Post board member Barry Diller, chairman of IAC/InterActiveCorp (IAC), which, among other ventures, had launched The Daily Beast, a digital news company. In the deal with IAC, Newsweek would be merged with The Daily Beast. Tina Brown, a well-traveled editor who had notable stints at Vanity Fair and The New Yorker, became editor of the merged Newsweek-Daily Beast entity. The venture undertook some interesting initiatives, but had rocky going as it went through changes. In October 2012, Brown announced that Newsweek would cease print publication with the December 31, 2012, issue and transition to an all-digital format, to be called Newsweek Global. On August 3, 2013, IBT Media, a global digital news organization based in New York, announced it had acquired Newsweek from IAC on terms that were not disclosed. The acquisition included the Newsweek brand and its online publication, but not The Daily Beast. The Washington Post, meanwhile, was having it own financial difficulties, as the Graham-family owned and run newspaper was bleeding pretty badly with successive years of losses. August 2013: Washington Post sold to Jeff Bezos. On August 5, 2013, Amazon.com founder and billionaire, Jeff Bezos, announced his purchase of the Washington Post for $250 million in cash. The deal stunned both the Washington, D.C. community and the larger world of media and journalism, finding this a particularly distressing sign of how poorly the print journalism business was faring in the internet age. Still, for both Newsweek and the Washington Post, there was hope of better times ahead, at least in some form, assuming as well that the very considerable and historically-valuable archives of both organizations would continue to be preserved, protected, and made publicly available in the decades ahead. 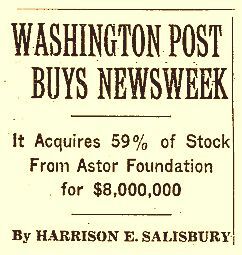 Harrison E. Salisbury, “Washington Post Buys Newsweek; It Acquires 59% of Stock From Astor Foundation for $8,000,000,” New York Times, Friday, March 10, 1961, p. 17. “Newsweek’s News,” Time, Friday, March 17, 1961. “More Fanciful Than Real,” Time, Friday, October 12, 1962. “A Discontented Man,” Time, Friday, August 9, 1963. David Halberstam, The Powers That Be, New York: Alfred A. Knopf, 1979, p. 364. Amy Janello and Brennon Jones. The American Magazine. New York, Harry N. Abrams, Inc: 1991. John Tebbel, and Mary Ellen Zuckerman. 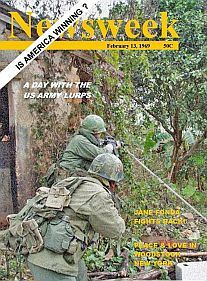 The Magazine in America: 1741-1990. New York, Oxford University Press: 1991. 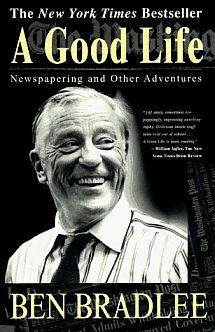 Ben Bradlee, A Good Life: Newspapering and Other Adventures, New York: Simon & Schuster, 1995, pp. 223-253. David E. Sumner, “A History of Time, Newsweek, and U.S. News & World Report,” Encyclopedia of International Media and Communication, 2003, Academic Press: Ball State University, November 5, 2005. “Washington Post Group: Overview,” Ketupa.net, November 5, 2005. Mel Gussow, “Newsweek Alumni: Nostalgia and History,” New York Times, March 1, 2004. 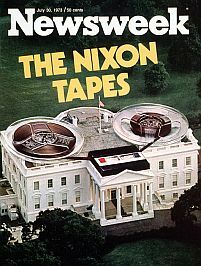 Newsweek, History & Background, MagsDirect.com. “Business Properties-Newsweek,” Washington Post Company.